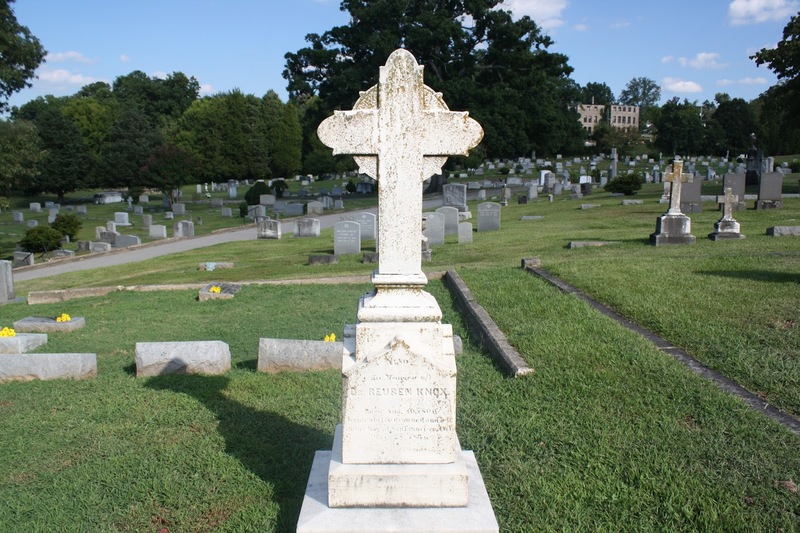 Dr. Reuben Knox: "Accidentally Drowned & Lost in the Bay"
Yesterday’s visit to Oakwood Cemetery in Raleigh, North Carolina was a short, but interesting one. My friend suggested that we visit a cemetery, so she and her daughter were exposed to a whirlwind version of The Dead Bell experience. During the two hours on the grounds I didn’t take very many photographs but I happened upon a very interesting inscription on the side of a cross-topped pedestal marker. When I took the picture I was so excited about the epitaph that I didn’t see the “Also” above the name and didn’t look around the other sides of the monument to see if there were additional names inscribed. According to Oakwood’s burial database, there are 11 people with the surname “Knox” buried in the Battle section, Division D, Plot 2. Reuben’s name is among them even though the marker suggests that his body was never found. It’s not uncommon for someone to be memorialized in the family burial plot in cases where there were no remains to bury. If those accounts are true, Reuben was born Massachusetts and moved to Kinston, North Carolina as a young adult. He married Olivia Kilpatrick in 1829 and the couple had five sons before Olivia’s death in 1839. 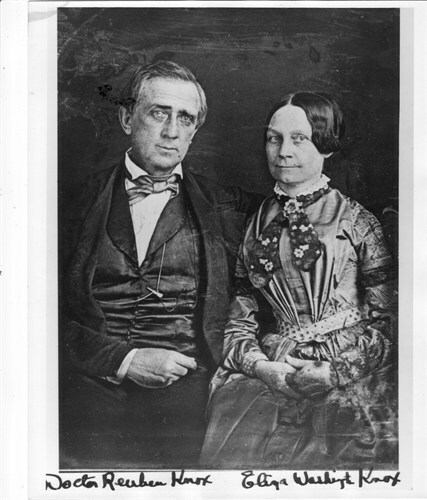 By the time Reuben married widow Eliza Washington Grist in 1840, only three of his children by his first wife were alive. Eliza b from her brought one child to the marriage from her first husband and in 1842 Eliza and Reuben’s first son was born. The family moved to St. Louis, Missouri and by 1849, three additional children were born. (Reuben Jr. only lived from 1844-1845.) 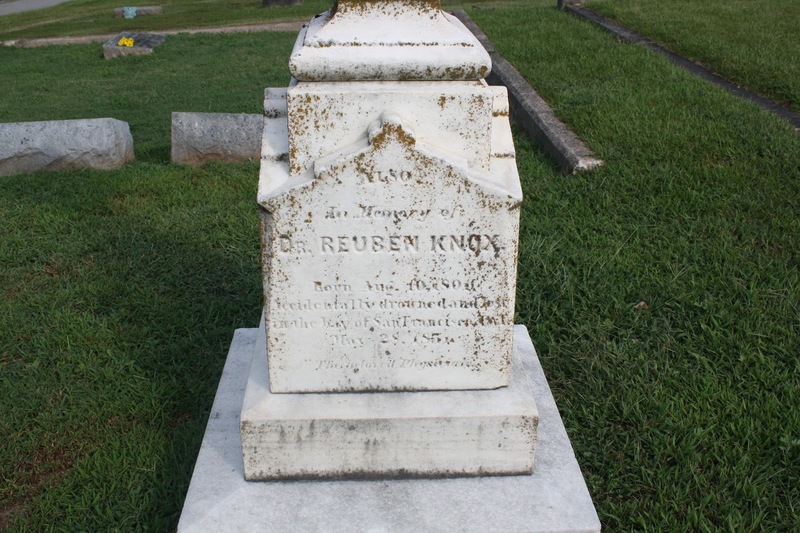 There Dr. Knox practiced medicine and engaged in various business ventures. The cholera epidemic of 1849 may have overwhelmed the doctor to the point that he felt that he needed to head West in order to better provide financially for the family. The plan was for Reuben, two of his sons, a nephew, and several slaves to set up a business and homestead in California while Eliza and the younger children stayed with relatives in the East. Reuben arrived in California in September 1850 and as planned, opened a mercantile. Around 7:30 p.m. on May 28, 1851 Reuben and his crew sailed the San Francisco Bay in a boat weighted down with two to three tons of equipment. 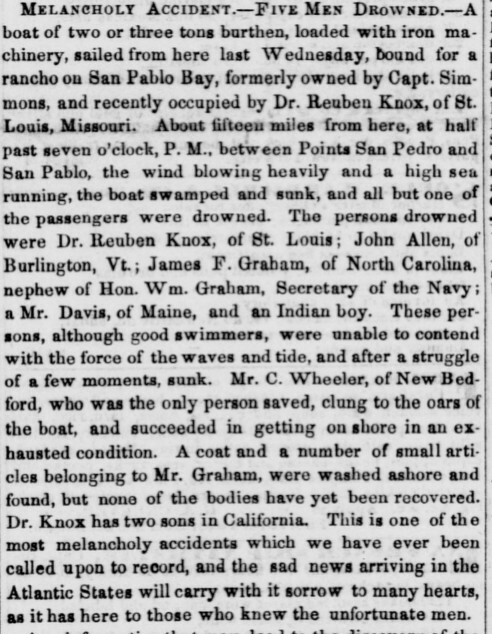 The other people on board were James Graham, Mr. C. Wheeler, a Mr. Davis, John Allen, and “an Indian boy.” The destination was Dr. Knox’s ranch settlement on San Pablo Bay but Mother Nature had another plan for these travelers. High winds and treacherous waves caused the boat to take on water and sink. Even though the men were strong swimmers, they weren’t all able to overcome or outsmart the power of the turbulent bay. Five of those on board drowned and to my knowledge their bodies were never pulled from the shared watery grave. Only Mr. Wheeler escaped death with the aid of the vessel’s oars.